Child Development 1 Edition The Big Picture of Child Development. 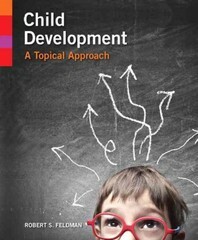 The exciting first edition of Child Development: A Topical Approach is arranged in a way that helps students to see the “big picture” of development across the entire span of childhood and adolescence. Offering a modular approach, this text provides a broad overview of the field of child development. It covers major topics such as physical development, cognitive development, and social and personality development. Child Development captures the discipline of Child Development in a way that excites readers about the field and draws them into its way of looking at the world. The text is rich in examples and illustrates the applications that can be derived from the research and theory of child developmentalists. MyPscyhLab is an integral part of the Feldman program. Key learning applications include, MyVirtualChild, MyPsychLab video series, and Flashcards. This text is available in a variety of formats — digital and print. Pearson offers its titles on the devices students love through Pearson’s MyLab products, CourseSmart, Amazon, and more. To learn more about our programs, pricing options and customization, click the Choices tab. Teaching & Learning Experience Personalize Learning – MyPsychLab is an online homework, tutorial, and assessment program. It helps students prepare for class and instructor gauge individual and class performance. Improve Critical Thinking -- Review, Check, and Apply Sections – Interspersed throughout each chapter are short recaps of the chapters’ main points, followed by questions designed to provoke mastery of the material and critical thinking. Engage Students – Many chapters include an interview with a person working in a field that uses the findings of child and adolescent development. Among those interviewed are a counselor for a treatment center serving teenagers confronting substance abuse, a childcare provider, a neonatal nurse, and a preschool teacher. Understand Diversity – “Developmental Diversity and Your Life” sections that highlight issues relevant to today’s multicultural society. Explore Research – “From Research to Practice” boxes describe current developmental research or research issues, applied to everyday problems. Support Instructors – All supplements were developed around the textbook’s carefully constructed learning objectives.